Google sends an absurd amount of traffic to this particular post here on this site every day and as a result, I get a LOT of emails about it. The other day it occurred to me that most of my replies to these emails had a common theme: in order to change our relationship with food to a more positive one, we need to build good habits around food. Mostly because, when something is a habit, we don’t have to think about it as much. I got into a conversation on Facebook the other day about classifying foods as ‘bad’ and ‘good’. And I took the point that it’s not a very useful way to go about things. So instead, I’m going to classify foods as nourishing and non-nourishing. 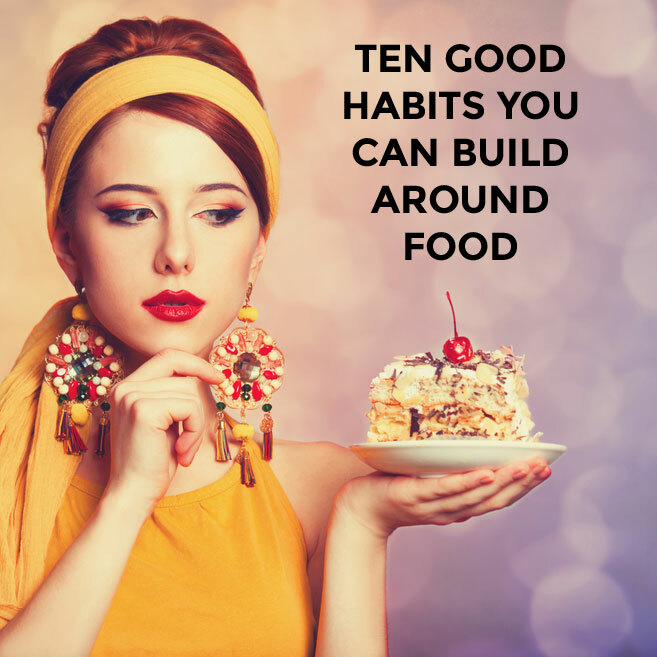 This habit is so simple: if a food is not in your house, you can’t eat it. So stock your fridge and pantry with the nourishing stuff and leave the packaged and overly-processed (non-nourishing) foods where they belong … at the supermarket. In Better than Before, her book on building great lifetime habits , Gretchen Rubin talks about this strategy. It’s actually related to number one above. If you make it easier to do something (in this case, eat something), then you’re more likely to do it. And vice versa. So where number one is making it very inconvenient for you to eat something non-nourishing (you’d have to leave your house to go get it), you can also make it more convenient for yourself to eat nourishing food like fruit and veggies by (say) putting fruit in a bowl on the counter where you can see it and having cut up veggies with an avocado or hummus dip ready to go in the fridge for when you feel peckish. I was very late to the green smoothie party. Like 2015 late. I know. But I got there in the end and I cannot tell you how much easier they have made my mornings. I no longer have to think about what to have for breakfast each day because I know I’m having a smoothie. I have 2-3 recipes that I stick to because I can make them all in less than five minutes and they are complete meals in that they have good fats, protein, liquids and veggies in them. It’s so good to know that if I eat nothing good for the rest of the day, I’ve at least gotten some good stuff into me first thing in the morning. Having heaps of veggies crowds out your plate, and makes you less likely to pile your plate up with less nutritious stuff. When you feel full and you’re eating a processed food, the bliss point that’s been engineered into that food makes you ignore the fact that you’re full. Veggies make you feel full, but they don’t have a bliss point. So you’re not tempted to over eat them (and even if you did, it’s not the worst thing in the world). Thirdly, in focusing on what you CAN eat (yum, lots of veggies), you’re less likely to be worried about what you’re not eating. If you’re looking for some practical ides for getting five cups of veggies into your day, Carly Jacobs and I offer up plenty in this podcast. Seriously, this is such an easy ‘hack’ when it comes to good eating habits. No matter what size plate we have, we tend to fill it when dishing out food for ourselves. And we feel obliged to eat every last bit on that plate, even if we’re full before we’re done. This is a hard thing to override (those people who are able to just stop eating when they’re full have a lot more self-control than I do). So I’ve taken to serving myself on a smaller plate. And I’m always surprised just how filling that plate can be. I also enjoy the feeling of finishing a meal feeling satisfied rather than ‘full’. Funnily enough, this has been one of the hardest habits to add to my life. I am a big fan of delayed gratification so I’ve always left the best bits on my plate for last. But I’m getting there slowly and what I’m finding is that by eating the best bits first, when I start to feel full, it’s much easier to leave stuff on my plate because the stuff that’s left is my least favourite. I did a health challenge with my CrossFit box last year and one of the things in that challenge was to start each morning with two giant glasses of water (I put a squeeze of lemon in for extra taste). This is a good habit for a number of reasons. I have found these two giant glasses of water wake me up better than any cup of coffee ever has. We tend to go to bed dehydrated … which means we wake up 6-8 hours later even more dehydrated. Often, when we think we’re ‘hungry’, we’re actually dehydrated. So getting water into our body first thing in the morning is a good thing. While I don’t want to get on the ‘lemon in water is a magical unicorn’ bandwagon – I know from personal experience that it kick starts my digestive system nicely every day and this is kind of magical for someone whose digestive system used to resemble that of a constipated elephant. I’m going to make the assumption that you aren’t heading out to dinner at a restaurant every night of the week. So when you do, tell yourself you’re going to have dessert, but you’re going to share it with your partner or friend. This takes away the pointless agonising of “Should I? Shouldn’t I? Nah, I’ll be good. But everyone’s dessert looks so yummy …”. 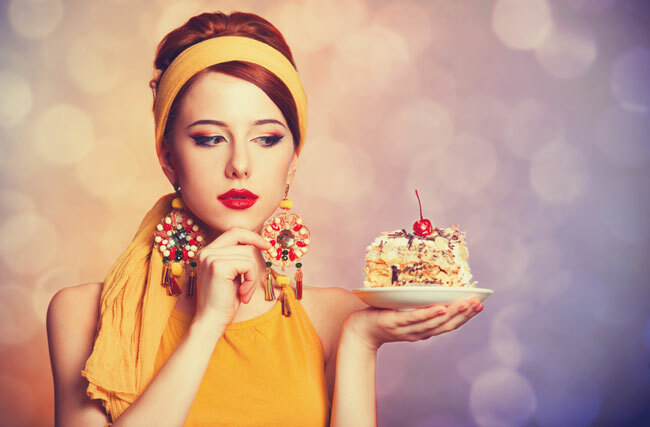 Knowing I’m going to have dessert means I tend to eat less of the mains and sharing with a friend gives both the pleasure of eating of the dessert … and the virtuous feeling of not eating all of it (because truly, restaurant desserts are usually ridiculously huge). Ok, I don’t always sit down to eat. But when I find myself falling into the habit of mindless picking over the course of a day, I activate this one as a circuit breaker. It’s another strategy that eliminates any feelings of deprivation. If I want to munch my way through a handful of pretzels (and then another handful), or a bowl of grapes, I can do so. I just have to sit down at the table to do so first. It eliminates a lot of added sugar (because when fat gets removed from something like yoghurt they add sugar). You get full faster and feel sated for longer. And if you want to listen to a really great podcast about why some people find it easier to create good habits than others, Brooke McAlary chats with Gretchen Rubin on that very topic here. It is insanely useful.